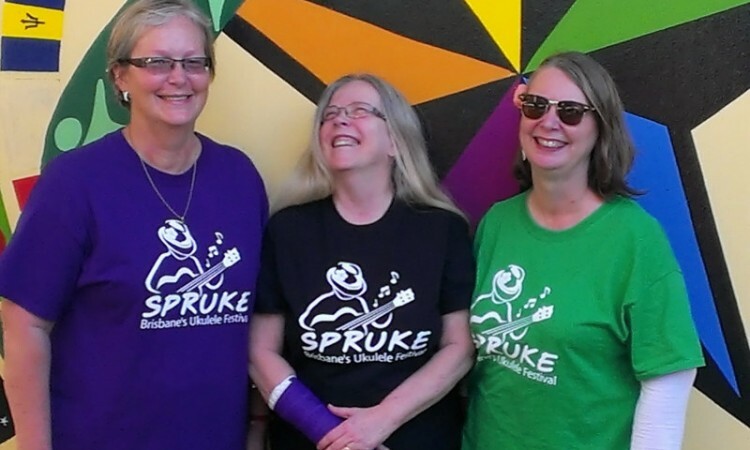 Fabulous gear to wear at SPRUKE or get a souvenir to take home and show your love of the uke. All festival T-shirts are available on line from BUMS Bazaar. So you can check them all out choose your Style colour and size and get it delivered so you are looking sharp from day one of the festival. This year we have T’s for men and women, polo shirts, tank tops, and singlets. Thank you to the Print Bar for making and delivering all our shirts. Quick delivery Australia wide! Express & International shipping options are also available! Some fortunate Brisbanites may have the opportunity to buy a Festival T from a jam before SPRUKE, but stock is very limited and you’ll have to be quick to score one of these! More festival merch coming soon….